Stain resistant neckties, microfiber ties, care free neckties, service ties, restaurant ties, waiter uniform ties and neckties, Men’s ties for caterers and catering services. Microfiber ties are the perfect stain resistant necktie for you restaurant, hotel, or catering services. Over the past few years, advances in the development of synthetic fabrics have given us the opportunity to create the ideal service uniform tie. Our stain resistant, and care-free neckties are our most popular ties for restaurants, hotels, and caterers. Click on your favorite necktie design below and choose one of the many colors available. Microfiber is a man-made material that consists of a unique mix of polyester and polyamide. Mixing both of these materials allows us to spin it into a microscopic thin yarn, that is later woven into a fabric. The diameter of the individual microfiber thread is actually smaller than silk. Because of this, microfiber ties have an exceptionally soft feel and excellent shine. 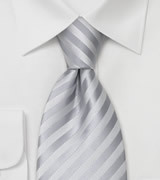 Chances are that you will not be able to tell the difference between one of our microfiber ties and a quality silk tie. Almost 50% of all our neckties sold are made from this unique fabric. The advantages of using microfiber fabric for uniform ties are endless. Most of our customers value the lower price-point in combination with the exceptional silk-like look of the ties. In addition, our microfiber ties are very stain resistant. The reason for this is simple. The yarn is not dyed like silk yarn is. Instead, the dye gets added to the mixture of polyester and polyamide. After this, the mixture is spun into a yarn. The thread is already saturated in dye and will not take on stains afterwards. Contact us to get additional information on wholesale/ bulk order prices on our stain resistant neckties. Our 24/7-support team will be happy to assist you. The ideal service necktie for the restaurant and catering industry. Microfiber ties, mens ties for restaurant food service. Uniform neckties to low prices. Discount neckties for bulk ties orders. Wholesale neckties prices area available for large quantity necktie orders.